This elasticized knee sleeve provides comfortable compression and support around the knee. 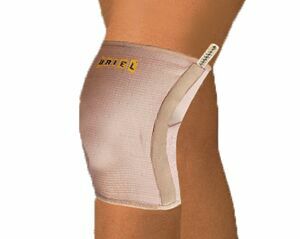 The CRISS CROSS structure provides relief without effecting the blood circulation or free knee movement. With two removable side rods for additional support. Indications: Reduces swelling after knee injury and provides support to the joint and surrounding structures. May be used to reduce pain in osteoarthritis or anterior knee pain. Simply wear the knee sleeve as you would a sock until it fits comfortably and symmetrically around the knee (as shown in the picture).